by "Rose-chan" (Stephanie) and "Foxwuzrt"
This was our 4th trip out to Dreamland and certainly the most thrilling. Though what happened this time around scared the living daylights out of us all, we haven't been scared enough to stop coming and have a trip planed this summer. 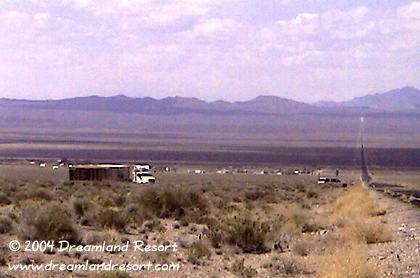 We spent a total of 3 days of our 5-day road trip in the Groom Lake area. After securing a room at the Meadow Lane Motel in Alamo and having a brief and pleasant (as always) lunch at the A'Le'Inn we went to kill some time at the Back Gate before we "met our bus". After about three or four miles down Back Gate Road an old looking flatbed truck sped around us toward the gate. At his fast speed I was surprise he didn't run off the road. But anyway, he left us in his dust in a matter of seconds. After the dust from him cleared a few minutes later we saw a Cammo Dude speed from a dirt road on the right and, once more, stir up enough dust to cause us to slow. All this was pretty exciting, but what would come next was even more shocking to us. We approached the back gate finally to find its arm up and a Cammo Dude's jeep sitting there glaring at us. Behind it was a huge unidentifiable truck that was obviously a wide load. Both vehicles flashers were flashing, yet we stayed for a moment to get some pictures. I even opened my car door to get an unobstructed view. However, then the Cammo Dudes vehicle lurched forward a little bit. This scared us so I slammed my door shut and we turned around. The Cammo was actually FOLLOWING us, and very quickly. Behind him the truck left the gate. Obviously he was escorting it. The Cammo got so close, well under 50 feet that we had to speed up to avoid him ramming into us (or so it seemed. I'm sure he wouldn't have… but you never know). For the 10 minutes it took for us to leave the Back Gate Road (which was a record for us) we watched as not one, but TWO Cammo Dudes leap- frogged around the huge vehicle. Each time they would switch places (one in front and one in back) the one in the front would get very, very close to us. Finally, we reached the road and pulled onto the shoulder about a mile away down 375 from the entrance to the Back Gate Road. 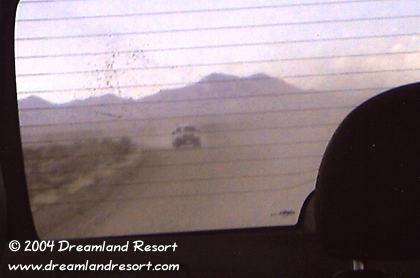 Finally we saw what this huge, menacing vehicle that had been tailing us was… half of a manufactured building. Oh well. It was still a thrilling chase. After that we went to "meet our bus". We timed it so that we would make it to the end of Groom Lake Road at 4:50, just as it passed the signs. Sure enough it was on time and I got good footage of it. At that point it was time to return to our room in Alamo. Oops! The bus was headed that way too. We just happened to catch up to it at the end of 375. Completely coincidental, I can assure you. I can imagine the bus driver looking into his rearview mirror and being like "you again?!" Still, it was a great ending to a great day. Later that night we did, however, see orange orbs in the sky off toward the base and hear fighters. Later we were informed by the staff at the A'Le'Inn that those were targets and it was all routine exercises. Many people were discussing things that happened that night when we left in the morning including a sonic boom that happened around 10:00pm and flashes in the sky toward groom. We got up early and headed toward Rachel for breakfast. 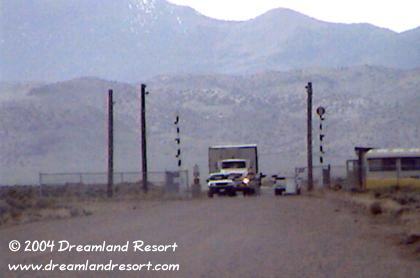 We once more noticed signs for an "Area 51 Research Center" and this time pulled off the road to check it out. Nothing was there except for a huge crate, a foundation, and a mobile home. Hopefully next time it will be a bit more, um, complete. After that and breakfast we set off down GLR to explore parts of the border we haven't explored before... bad idea. Fun, but scary. I had examined maps of dirt roads in the area closely and chose one that led off toward White Sides Mountain. I had heard that there really wasn't much to see there, but I am the type of person that just has to see for myself. First I climbed on top of Campfire Hill for a great view of the area. Then we set off to hike down the trail to where the signs should be. It was a very windy day and every hundred yards or so I would stop and listen to the wind. It sounded like helicopter blades. My friend assured me it was just the wind. I had read to many stories online, so I was a bit edgy. However, after about 20 minutes into the trail I heard it again, but nothing around me was moving in the wind. Nothing! I looked at my friend and she just stared right back. Without saying a word we dashed back down the trail just as the Black Hawk appeared behind us near White Sides. After we rounded the curve we met my mother, who was at least 1/2 a mile behind us due to her knee injury. She hadn't seen it yet, but merely seconds later it appeared again over the ridge and she ran with us. Who knew someone with a bum leg could run so fast? The Black Hawk disappeared in the distance and we collected our composure, but continued at a brisk pace back to our car. We rounded yet another curve and Campfire Hill came into view, only this time a Cammo was sitting on top of it. Behind him in the sky the Black Hawk was coming back at us head on. Terrified again we dashed for the car and slammed the doors. At least he couldn't kick up too much dust at us now. The Cammo backed up and waited for us at GLR. At this point the Black Hawk was hovering a few miles away just watching us. Ok guys! We get it! We are leaving! The Cammo backed up and blocked GLR just to be sure. No need! We are outta here! I can imagine the pilot of the chopper laughing at us. There we were, a group of teenage girls (my mom could pass as a teenager :-)) running out of this canyon, our ponytails waving behind us and our girlish screams bouncing off of White Sides. What kind of threat were we, really? Anyway, back down GLR we drove and thus ended yet another exciting moment at Dreamland. The rest of the day consisted of a brief nap at our motel, waving "hi" to the bus as it turned onto 375, and then watching the sunset at the Mailbox. The sky was silent that night. No sonic booms. No orbs. After the excitement the day before, we were a little jittery. However, we still managed to head toward Cedar Gate. On the way we pulled over at what I have dubbed the "Corner of Area 51" (a place where the restricted area touches the highway and is only guarded by a weak barbed wire fence, about 1/2 mile or so past the Nye County line.) When I got out of the car to stick my hand over the fence and say "ha! 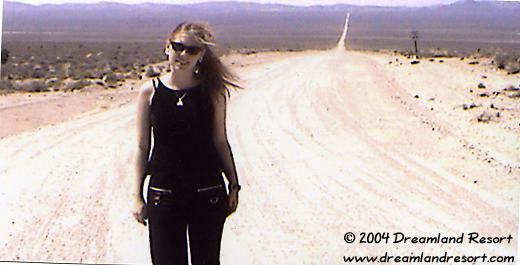 I am at Area 51" I heard a rumbling in the sky. Another chopper? No, not this time. Instead it was two fighter jets coming from the base. That was very thrilling! After they flew directly overhead the continued to circle around the valley for about half an hour before a third one (or possibly one that circled back behind us) appeared and did a few more maneuvers before leaving the area. After that we continued to Cedar Gate for the first time. It wasn't as exciting as the other gates, but still very amusing. There was a lot of traffic on this road. We had passed at least three vehicles going in and another one coming out. The best part of Cedar Gate though was the cows. Yep, lots of cows. There ended our third and final day in the Dreamland area. On the way home the next day it was pretty uneventful except for a spectacular air show at Indian Springs for about an hour. This was our best trip ever and we cannot wait until summer when we can revisit the area.